The pirate: a figure whose boon is the labor, money, and goods of others. A pirate is a parasite whose moral compass varies wildly; some pirates are heroic, most are simply base merchants. Along with “the delinquent, the youth, the criminal, [and] the gang member,” pirates are “anticitizens of a neoliberal social order” (1). In El Amate market we find pirated DVDs—mostly American and European films, but some Guatemalan ones too. To pirate an artwork is to defy its traditional authorial logics, to swing it into contested terrain. 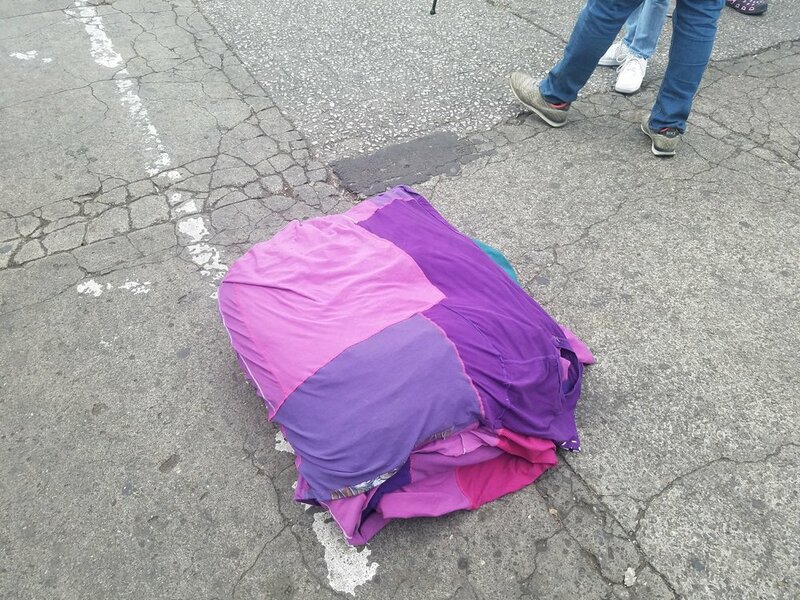 On the day of Pia Camil’s performance, Divisor Pirata, I, and several others who had been invited to the performance via Facebook, gathered in Guatemala City’s Parque Concordia. We stood around a tight purple package, bundled in a green piece of cloth like an oversized tamal. Camil’s performance set out to pirate Lygia Pape’s Divisor (1968), replacing the large white sheet originally used by Pape with a quilt of purple, red, and blue shirts purchased by Camil at a market in Itzapalapa, Mexico, but which very well could have come from one of the many pacas filled with second-hand clothing that line the streets of Guatemala City. Pape’s Divisor has been reperformed before, in Madrid in 2011 and in Hong Kong in 2013, both times with the permission of the Pape’s estate. But a pirate doesn’t ask permission. As we stood there waiting, we chatted and conversed. Conviviality was the order of the day, only to be interrupted by the odd firework thrown into the middle of the park by a group of teenage boys. As Camil, Jessica Kairé and Stefan Benchoam (the latter two are artists and co-founders of the NuMu who produced the project) unwrapped the package and spread out the rectangular field of sewn together t-shirts, their documentary crew snapped into action. A camera placed on a drone took video of the expanded purple field from above, and soon Camil and Kairé were placing members of the gathered crowd into the performance prop; one person, then two, then four, then ten. It was not long before people whose agenda for the day had not, until that moment, included being a participant in Camil’s performance, started to join in as well. A few kids, a man, a couple. Unlike Pape’s performance, where people appear as heads poking out of an otherwise unarticulated field of white cloth, each participant in Camil’s performance was marked by the design of the shirt they occupied. “I’m Not Crazy… I’m Just Grumpy,” read one shirt with a Disney character on it, another promised, “We R Just Like You.” Mine featured a pink mountain range, with text: “Colorado, Denver.” I’ve never been there. And then, something remarkable happened: a couple positions to the right of me, a street vendor, her shopping cart filled with chips and candy, was successfully coaxed to join. She was one of the many people I encountered during my time in Guatemala whose livelihood is tied to an extensive informal economy—the mobility of her cart allowing her to travel to where the customers are. Whether Camil knew it or not, when this person joined at the head of this new purple communal body, and as Divisor Pirata began to exit the park to travel down the main thoroughfare of the pedestrian street of La Sexta, she had rearticulated and reframed the violence that had occurred there only weeks before, when, in an effort to clean up the streets for the influx of families during the Christmas Season, roving vendors were expelled, and threatened with arrest should they return to their vending grounds. After walking to the edge of Parque Concordia this vendor promptly left the performance—knowing too well the boundaries that limited her movement, and unswayed by the potential cover that the cultural capital of contemporary art can sometimes provide. A block later, a clown took her place. That felt like a stab to the heart, because the absence of the stoic, but game, street vendor was suddenly plugged up with the nattering performance of a shouting clown. It’s not the clown’s fault: he was funny and jovial, as a clown should be, making fun of us, mostly, for how ridiculous we looked, parodying our calls for people on the street to join. But he didn’t stay long, either, for fear of leaving his position on La Sexta unattended. Fun is business, too, after all. In his place a mother and her wheelchair-bound son joined Divisor Pirata. Like the snack vendor, this participant had something to push in front of her, and like the snack vendor, she had her own conditions for her (and her son’s) participation. Other participants offered to place a purple t-shirt over her son’s head… she refused, knowing the mechanics of navigating a wheelchair all-too-well. She talked to her son throughout most of the six-block walk from the Parque Concordia to the Plaza Mayor, telling him what she was seeing, what the other participants in the performance were doing, or why we were stopped at a stand-still. During one of these stops, he looked up at her and smiled, and then he looked over at me. I smiled and said “Buenas!”— to which I was rewarded with a toothy grin. Before we reach our destination, they, too, leave. After blocks of this—of this pirated amoebic body expanding and contracting, of bouncing, whooping, and yelling for people to join—we arrive in the Plaza Mayor. We vacate the prop and gently, silently, Camil, Kairé, and Benchoam fold it back up. They wrap it in a green cloth. At the end of the performance we are left standing in the midst of this obscene commerce; rigidly policed, green and red pavilions everywhere. Whatever good feelings Camil’s pirated performance engendered are now muted, and subtly drained away. I am thinking about endings, about how the middle of this performance was full up with endings and loss, necessitated by economics and mobility. Where one is not allowed to go, for example, or how far one can step away from their business, or how many times a curb must be navigated by a wheelchair before it just gets tiresome. Leaving is not a choice. We all turn to go our separate ways, pirates no longer, but now mercenaries of memory. Thomas, Kedron, Kevin Lewis O’Neill, and Thomas Offit, “An Introduction,” in Securing the City: Neoliberalism, Space, and Insecurity in Postwar Guatemala (Durham and London: Duke University Press, 2011): 14.